Maui'd Forever, Hawaii's premiere wedding planning and coordination company is dedicated to being an effective and cost effective way to provide for one’s entire Hawaii wedding, reception needs. They have partnered up with Tom Barefoot’s Tours providing an activity agent that gives experienced advice and discounts on most of Hawaii’s activities. They have just released a new YouTube video that shows an experience most anyone that travels to Hawaii needs to experience, a luau. The activity in the video is of the Royal Kona Luau in Kailua Kona Hawaii. The luau is produced by Tihati Productions and is called the "LAVA- Legends and Legacies” is is located at The Royal Kona Resort on the Big Island of Hawaii. This luau has been a popular show for many years and features a complete island buffet dinner and Polynesian revue. 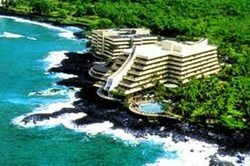 This is an excellent option for clients wanting do a wedding reception in Kona. Everything is done for the client including an excellent location, food, drink and entertainment. It also includes desserts to die for and an open bar all for under $70 with the discount Maui’d Forever provides. Seating starts at 5:00pm with a Shell Lei greeting and picture opportunities, 6:00pm is the torch lighting and IMU Ceremony, the buffet starts at 6:15 and the show at 7:00pm. This is another in a series of informative videos that is being made available to the wedding and vow renewal clients of Maui'd Forever. Maui'd Forever owner Mark Steffan tells us "that my knowledge of the Hawaiian Islands can be a great guide to clients seeking advice on what they should do while in Hawaii. I just need to know who they are what they like to do and of course what they are capable of doing". With these ongoing video productions, Hawaii activity clients can accurately preview what they are getting involved with. Getting to Hawaii is usually a long plane ride and a costly vacation and many prefer not to waste valuable time and money doing an activity that is just not right for them. These previews help prevent these types of mistakes. Maui’d Forever clients also get an experienced activity agent to assist them in the process of determining how they want to spend their time and money. Wedding Packages in Hawaii start at only $299. "That package combined with the luau make for a very affordable complete wedding experience" according to Maui'd Forever founder Mark Steffan. He also states that clients can make things even simpler with our all inclusive wedding experience.